Working from the road, literally - Work ... Uncaged. Sometimes plans don’t work out. Over last Christmas a good number of our relatives were planning to gather at our house. Unfortunately, an emergency involving hospitalization kept that gathering from happening. Without going into details, it was a very difficult time, which had our relatives spending a number of days in the emergency room. We were also quite concerned and decided to go make a trip to see and support our family. Before I continue, I’ll say right now that things looked dire, but turned out OK. Celebrating the holidays with our family, even in the hospital, was nice. In the grand scheme of things, work was clearly not nearly as important as being with family. However, I was also under some heavy pressure and deadlines. I had planned for some time off during the holidays, but not for an additional couple of days of drive time. The one-way trip takes about 12 hours and so it seemed that I would have to find a couple more days somewhere to meet my commitments. I’m fortunate in that I am a fully remote worker. In theory I can work from anywhere and anytime as long as I have Internet connectivity. With that in mind, I hatched the idea that I could work while we were on the road, assuming that I could be online for most of the drive. 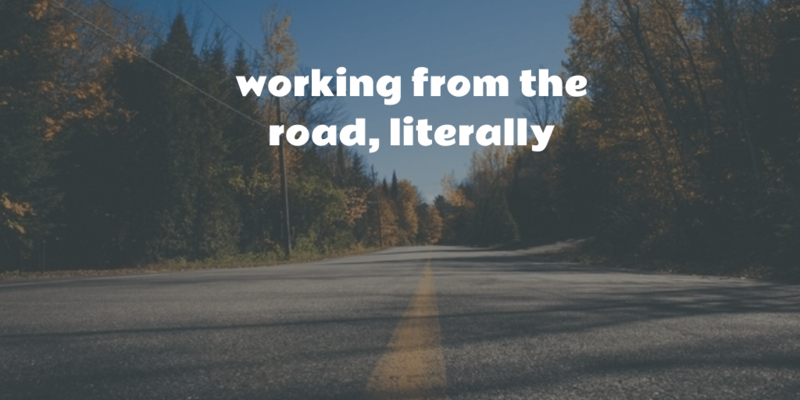 I’d be working from the road, literally. I’m a pretty happy T-mobile user, but I knew that coverage and data access were going to be spotty where we were going. On a previous trip I learned that we were data roaming. That came with a hard 100MB cap on data transfer and that there was no way to get that increased. This meant that tethering of my cell phone would not be an option. I also knew from experience that Verizon has pretty solid coverage in those areas. I used to be a customer of theirs, but coverage in my house was atrocious causing me to switch. My in-laws use a Verizon MiFi for all of their Internet needs and I thought, that perhaps I would be able to take advantage of such a device. After some searching, I found that Verizon has a pay-as-you-go plan for MiFi hotspots. The prices tend to be a little higher per GB, but there is no monthly or annual commitment. That makes it really ideal for the occasional usage I am looking for. So after picking one of those up at my local Best Buy, I was set. We headed out early in the morning and grabbed breakfast on the way. Shortly after I was ready to start on some work. The first part of the trip was primarily Interstate driving and my connectivity was absolutely awesome. My job involves working with computers in various parts of the country and I had no issues connecting (and mostly staying connected) to them. I was getting my work done. I kept my laptop fully charged through the use of a power adapter and I had more room to work than I would have had on an airplane. About half way through the trip there was a section of rural driving to cut over to another interstate. I wasn’t expecting to be able to work for most of that. To my surprise, I only lost Internet connectivity twice for under 30 minutes total. The connection speed was a little less, but that did not have much of an impact on me. All in all, I believe I worked nearly an 8 hour day on the trip there and again on the way back. That part of the impromptu trip was an awesome validation that I’m able to work from truly anywhere. I’m already looking forward to taking similar advantage of long travel times in the future. As a side note, if you are looking to buy one of these MiFi hotspots you might have to ask several times about the pay-as-you-go MiFi. Most places want to sell the monthly subscription version and at a Verizon store I was even informed that there was no such plan. Online resources clearly contradicted that. Go figure.